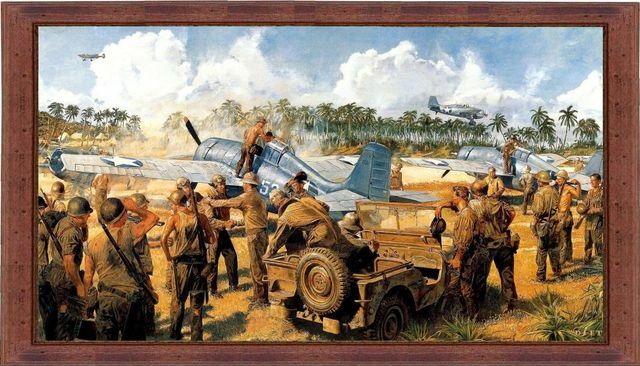 Grummann F4F-4 Wildcat - Henderson Field, Guadalcanal. Joseph Jacob "Joe" Foss de la VMF-121 revient de mission à Henderson Field (Guadalcanal). Son palmares de 26 victoires fit de Foss le meilleur as sur chasseur de la Marine de tous les temps. Joseph Jacob "Joe" Foss of VMF-121 comes back from mission at Henderson Field (Guadalcanal). His score of 26 victories made Foss the all-time leading Marine fighter ace.